See Tokyo Open Seminar 2017-09-18 for seminar announcement. 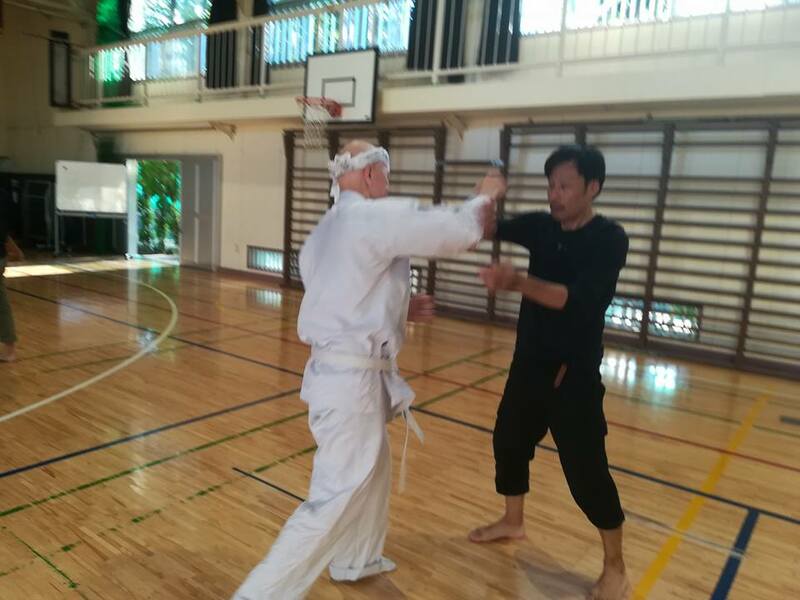 This post is a report after the seminar, given by Aunkai founder Akuzawa Minoru, in which sensei gave explicit guidance on how to use the kua and chest to control the arms and overall body usage, in an approach intended to be useful for martial artists in competition and sparring. 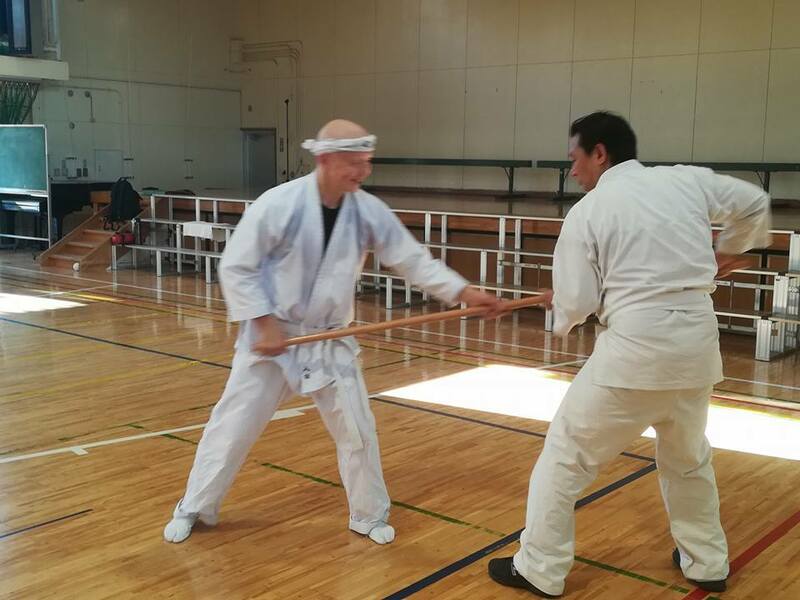 Despite the location being on the outskirts of Tokyo, it turned out to be very successful and a pleasurable experience for all participants, who enjoyed the intensive time spent on partner exercises designed to give feedback for one’s own training. Attendees numbered 14, with about half being members from the Aunkai organization, as well as a few repeat attendees who had experienced Akuzawa sensei’s seminars before. Among the new attendees was a gentleman from Kyushu, and one who had seen sensei’s interview on Youtube, as well as a lady boxing practitioner. 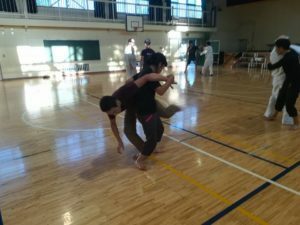 Sensei began the seminar with detailed versions of walking exercises, where one partner pushed on the other’s chest and the pushed person walked backwards without bracing, endeavouring to drop the push down the chest into the kua. 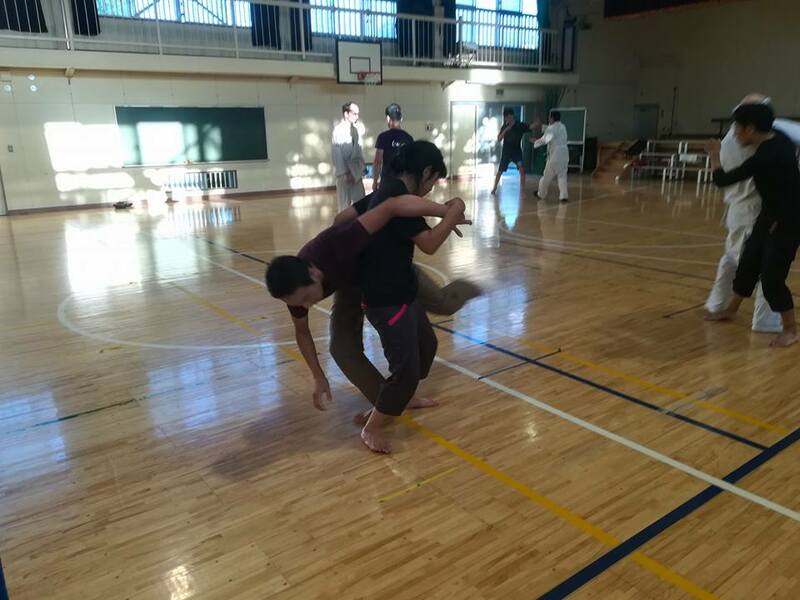 From that exercise, we moved on to walking with both arms extended, elbows straight, hands touching, and attempting to walk without leaning or bracing, using the drop of the chest and the turn of the kua in cooperation. Since the seminar was 4 hours long, and the day extremely hot after a typhoon the previous day, there were offcial water breaks every hour, and informal ones as the need arose. 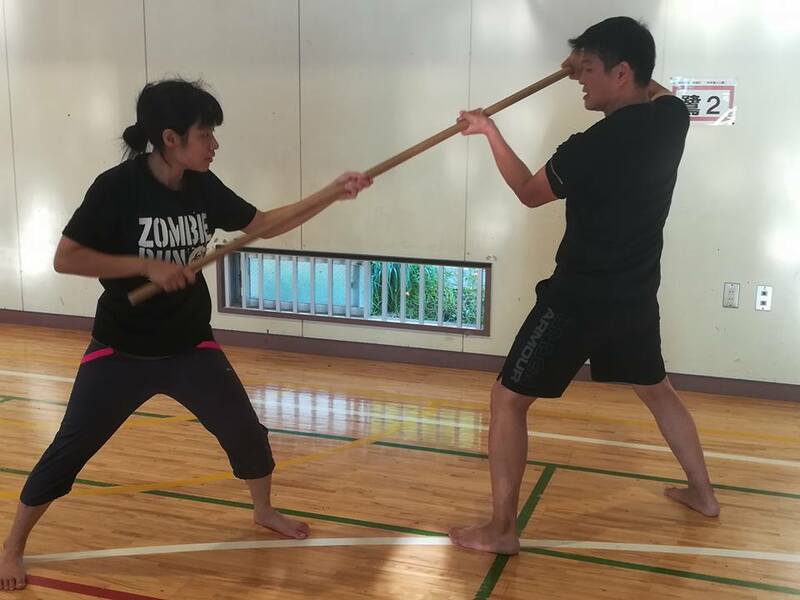 The next type of exercise involved one partner standing in wide stance with kua bent, with the other person pushing against the belly in a committed manner, just enough to put the pushed person at the limit of what they could absorb. The objective from here was to rely on the platform created by kua rotation and chest drop, and use the legs to step and then simply drop, leaving the partner to feel glued or stuck to the belly. After training pushing against the belly, the push position was changed to the middle of the torso, and then the chest. Feeling oneself on a platform without leaning, having free use of the legs without bracing, and sensing oneself as a unit with the partner attached, was a good introduction to how to deal with an incoming force such as a punch, as sensei demonstrated, handling it at the moment of contact in exactly the same way. 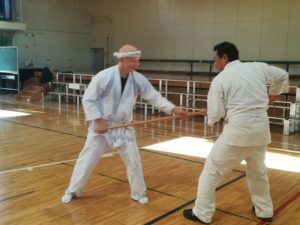 Sensei had participants train two to a staff for a while, to experience moving freely with a solid contact between the two partners. 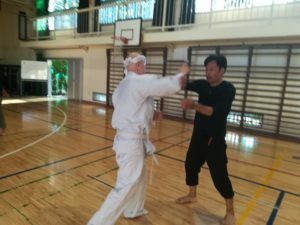 Owing to the heat, this training was done quite lightly, as people concentrated on getting their body to hold the lessons from the previous exercises. Finally we practiced movement and application against a simple straight punch from the partner, with sensei giving instruction to individuals on how best to adjust their body usage to keep a unit-like sense and avoid using normal strength. This was both relaxing and freeing, a great balance to the constrained exercises. After the seminar a number of participants joined in for a reserved dinner and chat until late in the evening, gaining even more open discussion with sensei. Body coordination training using rokushakubo. One of a set of standard Aunkai body coordination exercises.